David, popularly termed the titular saint of Wales, is said to have been the son of a prince of Cardiganshire of the ancient regal line of Cunedda Wledig; some, also, state that he was the son of Xanthus, son of Ceredig, lord of Ceredigion, and Non, daughter of Gynyr of Caergawh, Pembrokeshire. St. David has been invested by his legendary biographers with extravagant decoration. According to their accounts, he had not merely the power of working miracles from the moment of his birth, but the same preternatural faculty is ascribed to him while he was yet unborn! To this, his moral character, St. David added a high character for theological learning; and two productions, a Boole of Homilies, and a Treatise against the Pelagians, have been ascribed to him. St. David received his early education at Menevia, (derived from Main-aw, ‘a narrow water,’ firth or strait), named afterwards Ty Ddewi, ‘David’s Rouse,’ answering to the present St. David’s, which was a seminary of learning and nursery of saints. At this place, some years after, he founded a convent in the Vale of Rhos. The discipline which St. David enjoined in this monastic retreat is represented as of the most rigorous nature. 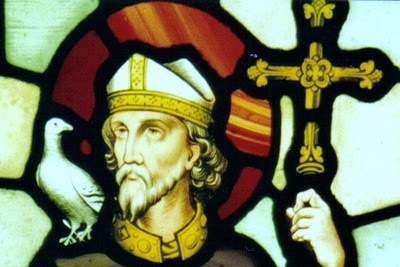 After the Synod at Brevy, in 519, Dubricins, or Dyvrig, Archbishop of Caerleon, and consequently Primate of Wales, resigned his see to St. David, who removed the archiepiscopal residence to Menevia, the present St. David’s, where he died about the year 544, after having attained a very advanced age. The saint was buried in the cathedral, and a monument raised to his memory. It is of simple construction, the ornaments consisting of one row of four quatrefoil openings upon a plain tomb. The Welsh custom of wearing leeks into battle is, like so many military customs, both ridiculous and moving. There’s a heart-rending photograph of some Welsh soldiers taken during the Second World War. The young men are cheerfully pausing on some god-forsaken battlefield on St David’s Day to eat raw leeks and drink champagne, standing on upended crates. The ancient tradition of eating and wearing leeks on St David’s Day supposedly goes back to the 6th century. It is said that St David ordered his Welsh soldiers to wear leeks in their helmets in battle against the despised Saxons and that the leeks won them victory. This is pure legend. But soon the association between leeks and war was firmly cemented in the Welsh mind. In the 14th century Welsh archers adopted green and white for their uniform in honour of the leek. And to this day the Royal Welch Fusiliers uphold the tradition of eating raw leeks on 1 March. 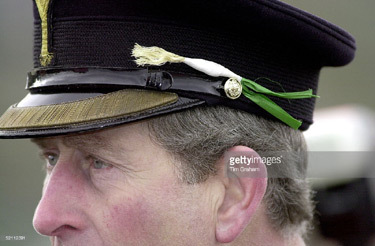 The Prince of Wales, in the uniform of Colonel of the Welsh Guards, wearing a small leek in his cap. Some Welsh singing from “How Green Was My Valley” (1941). One Feedback on "St. David’s Day"